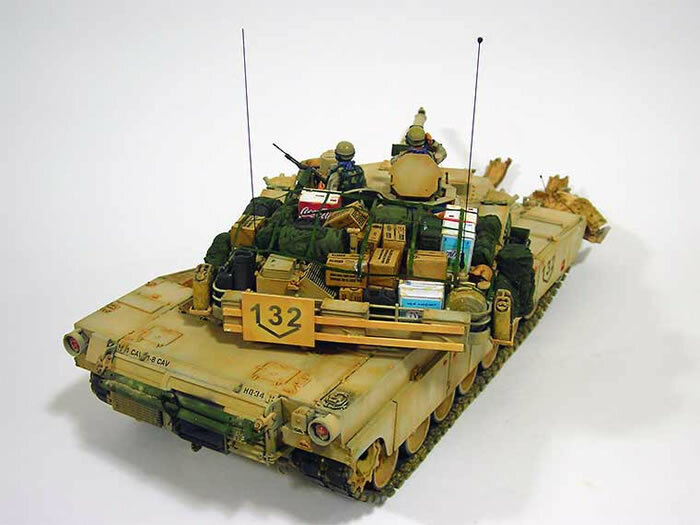 Kits Used: Dragon M1A2 SEP 3536; Verlinden US Tank Crew Iraq VP2277; Tamiya M1A1 T35158 Mine Plough; AFV Club M151 Remote Weapon Station AF35157; Tamiya Modern U.S. Military Equipment Set T35266; Tamiya Modern U.S. Accessory Set T35141. 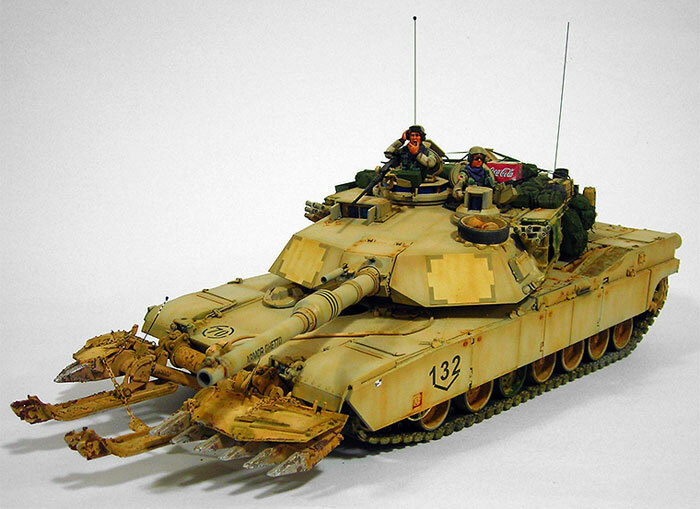 This kit started out as an attempt to reproduce the M1A2 SEP otherwise known as “Armor Ghetto”. There are limited photos are around and this complicated construction. 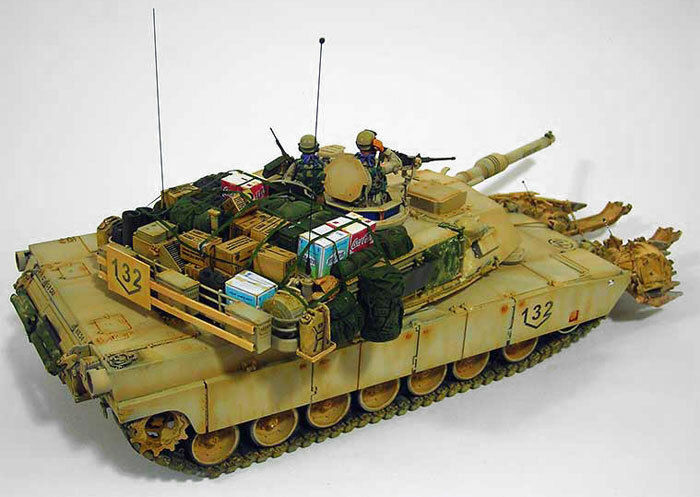 To simplify the project I utilised the Dragon kit with the Tamiya M1A1 kit which came with the mine plough. This vehicle however had the extra bars on the front of the plough. This proved fiddly to construct, and also as I intended to place this model in a diorama, I abandoned the construction of the extra front bars. Since the extra dimensions and by the extra bars water have extended the kit over the size of the base of the diorama, I made the decision to abandon the development of the extra bars. This is far as I can tell from the production photographs is the only option that I abandoned, however I am willing to be corrected on this. The Dragon kit proved to be a little difficult to assemble, requiring some force to fit the pieces together in various places. The Tamiya mind plough is excellent overall but nevertheless required some modification to bring up to standard. 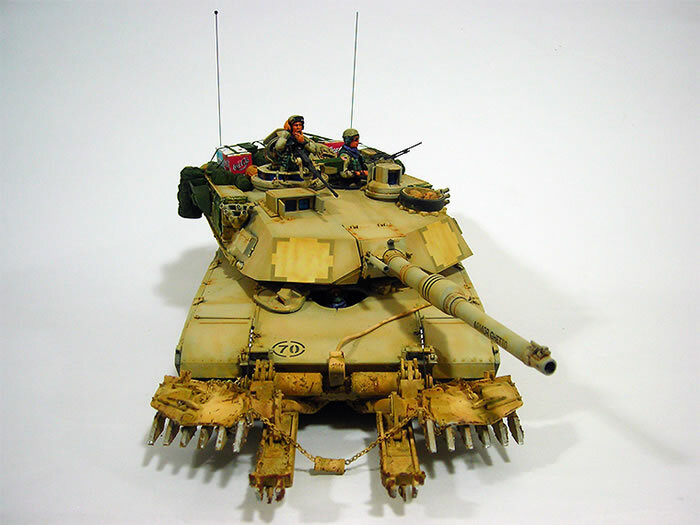 This was largely done by scratch building. 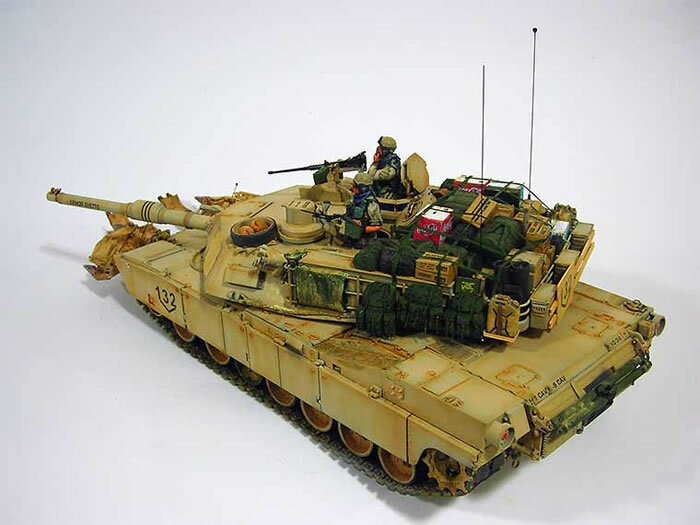 Nevertheless the dragon kit forms a great representation of the Abrams main battle tank. Overall I was satisfied with the Dragon kit despite some difficulty with its construction. I intend to place the final product in an Iraqi diorama set in 1993.